I’ve been curious about decor with denim for a while now. I especially love walls that look like jean material…is that done with paint or wallpaper? The shade of denim are endless, and if you’re going blue with your room interior design, adding some denim appeal give it a nice casual, yet crisp feel. Above pic via Ralph Lauren. If you don’t want to hassle with wallpaper, denim wall can be created relatively easily with paint, and a nifty wall paper brush. 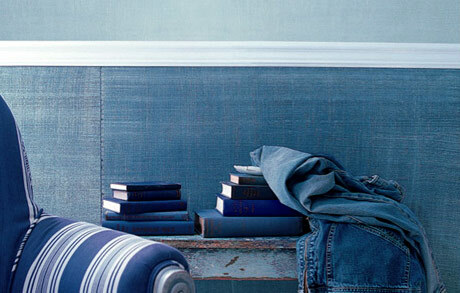 After picking your desired shade of denim roll it on the wall. Immediately after rolling, while paint is still quite wet, take the wall paper brush and stroke horizontally, then brush vertically to create the neat cross-hatched pattern that is recognized in denim jeans. A do-it-yourself idea that’s so simple I think I can even do this! Here are some more denim decor ideas. Enjoy! 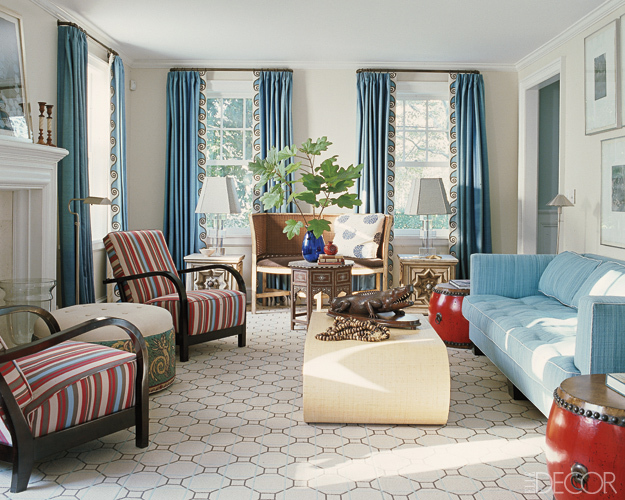 Splashes of soft denim color in curtains and the sofa. 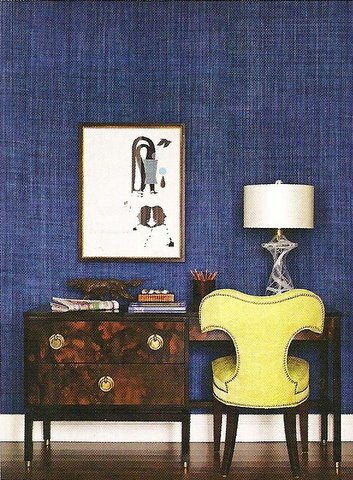 Elle Decor photo. Add to your apartment a sweet little denim couch with tons of denim throw pillows for a comfy style. Martha Stewart photo. 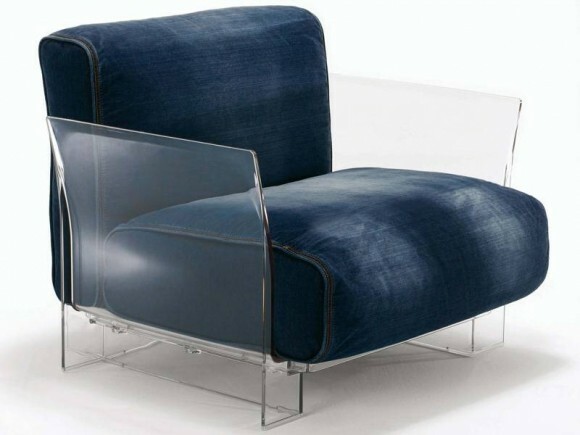 Kartell armchair in jean denim. Sleek and modern. I love it! Dare to go dramatically denim blue in your kitchen? There are some perks to it. According to color theories, adding blue in your kitchen actually reduces your appetite, thus making dieting easier. (Reds and oranges enhance appetite). 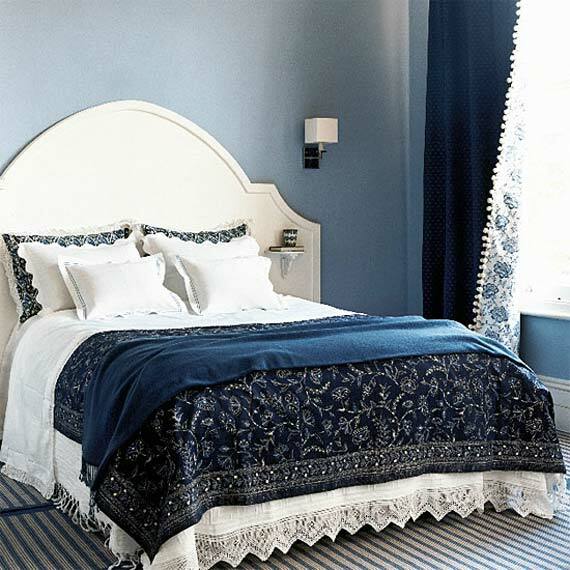 Denim and white in the bedroom is fresh and lovely and give a cool feel in summer months. This entry was posted in Colorful Living and tagged blue, decor, decor with denim, decorating, denim decor, denim wall, denim wallpaper, DIY, Do it Yourself, paint. Bookmark the permalink.